in the near future the two founders of the Society will be visiting the R.E.M.E museum to obtain information on this site which will be added to the website. This led to much conflict of interest, some ridiculous and very ingenious indenting for spares and tools and very disparate standards of efficiency from Unit to Unit. It was almost impossible to enforce best practices under such circumstances and efficiency was falling off rapidly at a time when a uniformly high standard was desperately needed.As a result of decisions made by a Cabinet Committee formed to overcome this problem, chaired by Sir William Beveridge. It was decided that a single Corps should be set up to deal with maintenance and repair of all Army equipment. To that end, the nexus of the Royal Electrical & Mechanical Engineers was formed in 1942. From the very beginning the newly formed Corps was designated Royal, a significant honour and indicative of the faith engendered in it’s innate ability to deliver the goods as required.Many Tradesmen from the RAOC, RASC and the RE’s were transferred to the newly minted REME, immediate steps were also taken to provide trade training and even Apprentice facilities for the new Corps. Because of the exigencies of the War and the difficulties in separating everything at once, with resultant chaos and resentment from established chains of command, it was decided to implement the changeover in two phases.Initially, in Phase one, each Regiment kept a small cadre of personnel on strength to do running repairs to vehicles and equipment. RASC Transport Company’s kept, for the time being, their own Base Workshops and the RE’s continued to maintain their own specialised equipment such as Construction plant and Railway Rolling stock. All Regiments and other units were affiliated to a Field or Base Workshop run by REME for their secondary and major repairs. They also carried out the recovery of knocked out tanks from the battlefield and to do this they eventually were equipped with Armoured Recovery Vehicles (ARV) which were versions of the basic tank, with no main armament, a dummy turret and with a crane and winch attached. This shows a Churchill ARV, which remained in service until the 1960’s. REME’s first test came in the form of the Battle of El Alamein and it’s ability to rapidly restore damaged vehicles and equipment to battle readiness was sorely tested but emerged triumphant. This was instrumental in enabling Monty’s lads to keep up the pressure that soon broke the Afrika Korps and the Italian Army’s ability to stand and slog it out. REME’s policy of providing repair facilities, known as Field Workshops, as close to the “Front” as possible was a great success.As a direct result of this success, REME continued to expand throughout the remainder of WW2 and soon became the biggest Corps in the British Army, reaching its maximum personnel strength of 160,000 all ranks in May 1945. Another result of the successful transition of the new Corps was the appearance of identical Formations within all Empire and Commonwealth Armed forces, modelled exactly on the original REME concept.In 1949, Phase two of the reforms was implemented and this was completed by 1952. This saw all Regimental light repair facilities come under REME aegis and all workshops and vessel repair facilities of RASC vehicle and boat Company’s under REME control.In 1958 the RAF relinquished control of Army Light Aviation repair and maintenance to REME. After a slow start, the Army Air Corps component of REME stands today at 9% of total personnel. 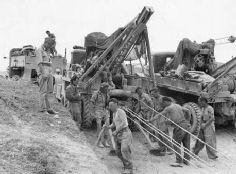 Other types of recovery vehicles were also used and the picture shows two Ward La France heavy 6×6 wreckers with Gar Wood jibs, in use by the British during a recovery operation in North Africa, with a Scammell Pioneer in the background. Gradually all other repair and maintenance facilities, with the singular exception of the RE’s Construction plant, have come under REME’s umbrella. So today’s Craftsman may be a Technician in the Information Technology field, or a Locomotive Engineer, Vehicle Mechanic of various sorts, Airframe/Engine Technician, even a Maritime Tradesman. Clerks and Storemen play vital roles too, as do Armourers and Instrument Technicians, Radar Tech’s, Recovery Mechanics and so on. The Royal Electrical & Mechanical Engineers encompasses as wide a range of Trades and skills as does any comparable organisation in the World. It was and is, without a shadow of a doubt, the driving force behind the British Army as we know it today. 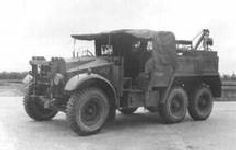 Other recovery vehicles included winch equipped lorries for lighter duties, such as the Morris CDSW 6 x 4 breakdown truck seen here. This was a development of the CDSW gun tractor, fitted with a 4 ton power winch.